Coffee, tea or other beverages are an essential part of our daily routine. Our days are incomplete without having them frequently throughout the day. A cup of tea in between our busy routine has become a habit. Different types of kettles are available in the market and choosing one from the other is just a matter of personal preference. Stove kettles are more traditional and have been used for centuries for heating water. Although electric kettles are becoming popular due to inconvenience and portability, still stove kettle has their appeal and have a prominent place in our kitchen. Stove kettles are simply built to be put on stove whether it is induction, halogen, or electric stoves. Kettles with elegant design and colors are available that you may choose according to your kitchen interior and color scheme. Electric kettles are useful for many reasons, but they need to be plugged in for heating water. That may not be very suitable in power cuts and for outdoor picnics. Stovetop kettles can be put on electric or gas stoves, and rest is easy. Stovetop kettles also heat water above boiling point and work well for extracting the flavor of tea leaves. Some of us like our tea strong and put the tea leaves in boiling water for extracting the strong aroma and flavor. We all have our method of preparing our perfect cup of tea, and a stovetop kettle is more suited to cater to these individual needs. Stovetop kettles have their advantages. Some of them are as follows. Making tea on the stove is a more traditional way, and we have all been doing it for ages. One of the reasons for choosing these stove kettles is the ease they provide. People are accustomed to the conventional way of preparing coffee or tea. They have developed the particular taste of tea prepared on regular stoves. For them, that particular taste cannot be obtained in any electric kettle. So, the first advantage of using a stove top kettle is the ease they provide. Stovetop kettles are easy to clean. You can clean the kettle just like an ordinary pot, and with regular cleaning, they remain in good form for a long time. You cannot submerge the electric kettle in water and have to be careful about damaging the electric heating elements. That makes the cleaning bit tricky and difficult. The mineral deposits in water can settle down in kettles over the period and can affect the efficiency of your kettle. But stovetop kettles are regularly cleaned and thus are more unlikely to have the thick coating of limescale inside. Stovetop kettle has a more affordable price. If you have a limited budget, you don’t need to spend more money on electric kettles when stovetop kettles work just fine. Stovetop kettles work on all kinds of stoves alike. Electric kettles become useless in power cuts while stovetop kettles keep working in all conditions. Stovetop kettles are durable. Due to their simple built and design they last long and are a onetime investment. Electric kettles are more fragile as compare to stovetop kettles. And due to the buildup of limescale and other mineral deposits, they stop working efficiently, but stovetop kettles are easy to keep and can stay in pristine conditions for long. Certain things should be considered before buying a stovetop kettle. A wide range of kettles is available in the market. There is a great variety of color, design, and material. You can choose the one that blends well in your kitchen interior and also matches your other pots and utensils. Choosing the one with the same color scheme can enhance the beauty of your kitchen. Always look for a kettle with a wide opening. Wide opening helps to clean from inside easily. With bigger spouts, you don’t have to open the lid for filling the kettle. 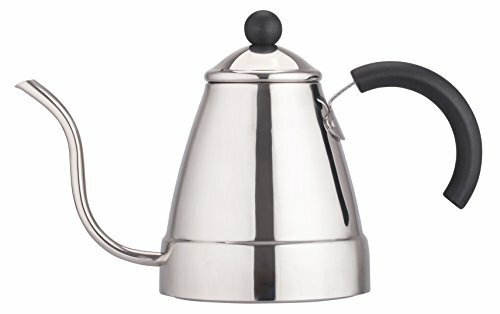 Kettles are available in all sizes. 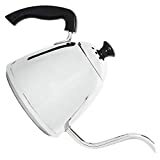 You can choose a small cute design if you are living alone or have few friends, but those who have large families or like to have big get together at home can make better use of a large kettle. 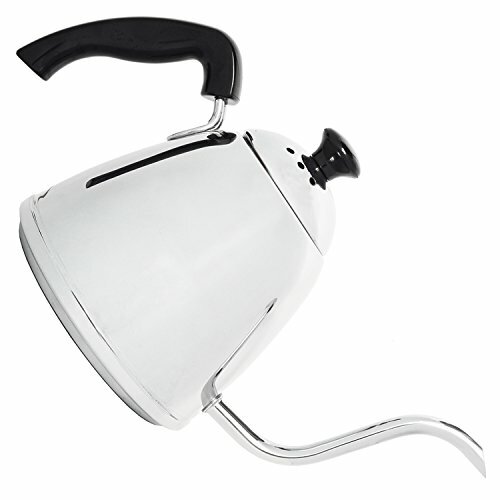 A large kettle is a mere energy waste if you require only a cup or two of tea. Therefore, knowing your needs and buying the appropriate size is important. Glass kettles are very popular due to their elegant look. They simply look amazing resting on stove or counter and can easily blend in any interior. However, they need extreme care due to their delicate built. Glass kettles also require gradual heating. They are easy to maintain, looks beautiful, and are more durable. These are extremely durable and are capable of retaining heat well. However, these kettles can get rusty with time and are heavy to lift. These kettles also work well and look great, but they can tarnish with time. Aluminum kettles are lightweight. They are also heat resistant and last longer. 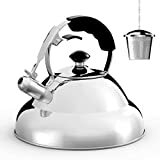 Aluminum kettles are also energy efficient and resist scratches and stains. Ceramic kettles also look very beautiful, and they are capable of maintaining the temperature of water for long. With these kettles, you don’t have to worry about the rust at all. If you are looking for a stovetop kettle, then this article can help you a lot. Below we have enlisted some of the best kettles in the market and have given a detailed overview of each. Take a look and choose the one that suits your budget, style, and needs. This elegant tea kettle by Willow & Everett is a beautiful piece that combines beauty with the functionality. One of the first thing you notice while holding it is its weight. 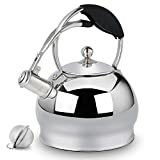 It is extremely lightweight but still unlike other lightweight kettles which are made from two or three layers of metal; it is made of five layers of the high quality of iron, aluminum, and steel. It has an ultra-wide bottom that heats evenly and quickly. The stainless steel finish is free of any harmful material like Teflon. Its shiny mirror exterior makes it stand out in any interior. With 3 liters of capacity, the kettle is suitable for an average family. The handle and spout lever on the teapot are coated with non-slip soft to touch silicon that protects your hands from burning. Its handle is ergonomically designed for easy grip. 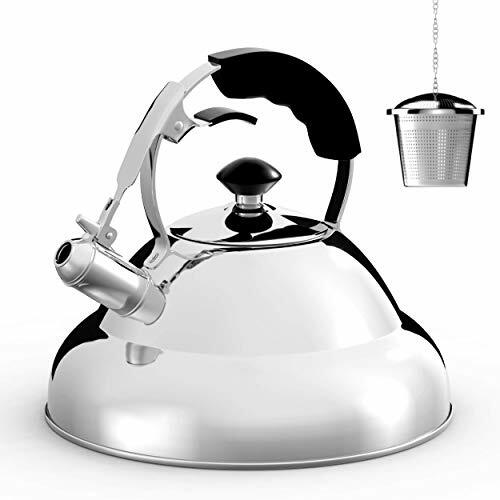 The kettle comes with a premium stainless steel strainer for brewing up tea with loose leaves. No doubt the kettle provides the best value for its price. 1. Looks beautiful and shiny with a stainless steel finish. 2. Made of five layers of high-quality iron, steel, and aluminum and thus is more durable. 4. Comes with a tea infuser. 5. Bottoms heat evenly and quickly. 6. It is ergonomically designed for easy grip. 7. Silicon coating on the handle that gives an easy and secure grip. 1. Spout seems bit narrow. This beautifully designed kettle looks fabulous in any kitchen and works on halogen, induction, or electric stovetops. Built with premium quality stainless steel, the kettle has three layers of metal. The stainless steel is rust resistance and corrosion resistant. The kettle gives a musical whistle when the water reaches boiling point. The kettle comes with a glove handle that saves you from burning hands while pouring tea. 1. Comes in an elegant dome shape. 2. It is made of high-quality stainless steel. 3. Musical whistle to alert when the water is boiled. 4. Comes with a glove handle. 5. Light and easy to carry. 6. Comes with a tea infuser. 7. Available in two colors. 2. The spout is not big enough. This one is another great option if you are looking for an elegant tea kettle. 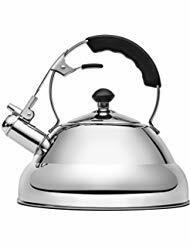 With its stainless steel material, the kettle is rust resistant, lightweight, and durable enough to withstand all dents or scratches. The kettle is suitable for all types of stoves be it gas, induction, or electric. A loud whistle alerts you when the water reaches boiling point. The kettle comes with a tea infuser for tea lovers who like to brew their tea with loose leaves. The high-quality food grade metal does not change the taste of water and gives you the exact flavor of your drink. 1. Made of high-quality stainless steel. 2. The kettle is rust resistant and durable. 3. Suitable for all types of stoves. 4. A loud whistle to alert when water is boiling. 5. Comes with a tea infuser. 6. Comes with a glove handle for carrying hot kettle easily. This kettle by Zell is a great choice that has a timeless design with modern design and a beautiful stainless steel mirror finish. Goose-necked kettle allows you to pour coffee or tea with ease and minimum tension. The high-quality stainless steel kettle will not rust, corrode, or affect the quality of your drinks. A stay cool handle gives a slip-resistant grip. Kettle is suitable for all stoves. 1. Gooseneck design that looks elegant. 3. Cool and non-slip handle. 4. High-quality stainless steel that makes it durable. This kettle by Steel Coffee is a stainless steel kettle that has a modern design and functions well on all kind of stoves. It is built with high-quality stainless steel that does not have any harmful coating. Premium quality steel resists corrosion, rust or scratches. Gooseneck makes pouring easy and controlled. The kettle is carefully designed and keeps water from spouting out of the gooseneck. The kettle has a capacity of 1 liter that means it is suitable for making three to four cups of tea or coffee. A secure and non-slip handle for easy carrying hot kettle. Its uniquely designed lid has multiple thermometers to gauge the temperature. You can control the temperature of your drink and avoid overheating. 2. High-quality metal that makes it durable. 3. Gooseneck design for controlled pouring. 4. Non-slip and stay cool handle. 5. The lid has a thermometer for gauging the temperature. 2. Has only one-liter capacity.